A whole chicken made in the Instant Pot made with rotisserie style seasonings. Pressure cooked at only 6 minutes per pound! Making a rotisserie style has never been quicker with the Instant Pot! Instead of an hour and a half in a rotisserie cooker, this chicken is made in about 30 minutes! I used a 5 lb chicken (approximately) and it was ready to carve in less than an hour! 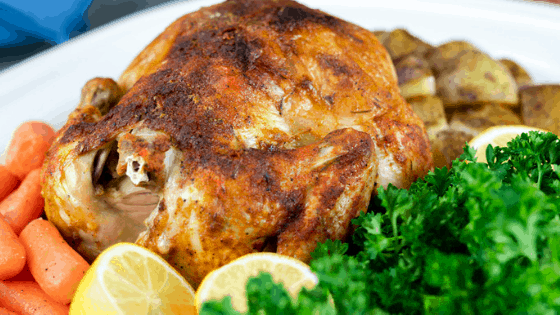 This chicken is made with all of the classic rotisserie style seasonings so you get the same traditional flavors! I have found that using extra seasonings in the Instant Pot is well worth it because some of the flavors can escape while the pressure is releasing. It’s also important to allow the pressure cooker to naturally release because by performing a quick release it will dry out the chicken. If you want your skin to be on the crispy side, then you’ll need to put it in the broiler. I usually set my oven to broil when the chicken is done pressure cooking and that way the oven is ready once the pressure has released. I transfer the whole chicken using the trivet that came with the Instant Pot. CAREFUL! The trivet will be hot! I grab ahold of the handles with silicone baking mitts to prevent getting burned – they work well! Whole chicken made in the Instant Pot with rotisserie seasonings. Gently lift the skin up from the breast of the chicken and baste with 1 tbsp of oil. Rub half of the spices under the skin and place the skin back on the chicken. Baste the remaining oil on the chicken and rub with the remainder of the seasonings. Pour 1 cup of chicken broth into the Instant Pot and place the trivet inside. Set the chicken down inside the pot on top of the trivet. Allow the Instant Pot to Naturally Release for 15 minutes before removing. This will the chicken from being dry. Place the chicken onto a baking sheet once it is done naturally releasing. Melt the butter and drizzle over top of the chicken. Broil for about 3- 5 minutes to make the skin crispy.